Paint Technique with Egg Yolks Binder: History, Characteristics: Advantages. By Andrei Rublev. Egg tempera.  What is Tempera Painting? Louvre, Paris. Tempera on Wood. Tempera and gesso on panel. Tempera (also called egg tempera) was a method of painting that superceded the encaustic painting method, only to be itself replaced by oil painting. Its name stems from the Latin word temperare, meaning 'to mix in proportion'. Unlike encaustic paints which contain beeswax to bind the colour pigments, or oil paints which use oils, tempera employs an emulsion of water, egg yolks or whole eggs (occasionally with a little glue, honey or milk). Tempera is typically applied onto a prepared surface. Wood panel paintings, for instance, were prepared with layers of gesso (a mixture of size and chalk) to form a smooth surface. The tempera was then applied (over a prepared drawing or sketch) and built up slowly in a series of thin, transparent layers. Unlike oil paint, tempera cannot be applied too thickly, and thus lacks the deep colouration of oils. But tempera paintings are very long lasting and colours do not deteriorate over time, unlike oil paints which tend to darken or lose colour with age. It dries rapidly, and when dry it produces a smooth matte finish. The main disadvantage - apart from the time-consuming need to apply it in thin layers - is that tempera paintings cannot usually attain the deep colour saturation that oil paintings are able to manage. Tempera painting techniques seem to have originated in Antiquity. Alas, due to the perishable nature of the medium, as well as the inevitable looting, not a single important example of Classical Greek painting in tempera has survived. However, numerous works in tempera have been recorded in Egyptian art - notably the Fayum Mummy Portraits (c.50 BCE - 250 CE). Tempera was also a popular medium in Roman Art: the best extant example is the "Severan Tondo" (c.200 CE, Antikensammlung Berlin), a portrait of the Roman Emperor Septimus Severus with his family, painted on a circular wooden panel. For a list, see: Painting Glossary. Following the collapse of Rome in the West, and the onset of the Dark Ages (c.400-800), the focus shifted to Constantinople, the centre of the Eastern Roman Empire. Here, the tempera method gradually superceded encaustic to become the principal medium for icon painting, as well as painted religious books known as illuminated manuscripts. As Russia was part of the Eastern Orthodox zone, icon painting (in both encaustic and tempera) spread to Kiev, Novgorod and Moscow, where it was an important form of Russian medieval painting. Among the greatest tempera panel painters of the Russian tradition, were: Theophanes the Greek (c.1340-1410), the Constantinople artist who founded the Novgorod school of icon painting; his pupil Andrei Rublev (c.1360-1430), arguably the most famous of all Russian iconographers; and Dionysius (c.1440-1502), noted for his panels in the Volokolamsky monastery. Meanwhile, tempera book painting flourished also in Ireland (c. 600 onwards) and western Europe (c.800 onwards). See: Making of Illuminated Manuscripts. Despite its ancient origins, however, the tempera method is probably most associated with medieval painting in Europe between 1200 and 1500 - a period that witnessed the rise of the Sienese School of Painting (c.1250-1550), Proto-Renaissance Art (c.1300-1400) and Early Renaissance Painting (c.1400-90). It was the standard method of panel painting during this period, until eclipsed by the new technique of oil painting. The use of tempera declined first among Flemish painters of the early 15th century, while Italian artists continued using it until the onset of the High Renaissance period at the start of the sixteenth century. Thus Leonardo Da Vinci (1452-1519) was one of the first artists in Italy to use oil paints as well as traditional egg tempera; while Michelangelo (1475-1564) who worked during the High Renaissance, painted mostly in oils. In fact, it was not uncommon in High Renaissance painting for artists to use a combination of both tempera and oil. Typically, tempera would be applied as a fast-drying undercoat, followed by a series of thin oil glazes. After nearly four centuries of neglect, tempera painting enjoyed a limited revival at the hands of early 19th century artists like William Blake (1757-1827), and groups like the Nazarenes and the Pre-Raphaelites. Certain 20th century painters also used tempera, including the Norwegian Edvard Munch (1863-1944), the metaphysical artist Giorgio de Chirico (1888-1978) and the Die Neue Sachlichkeit expressionist Otto Dix (1891-1969). In America the tradition was continued by American Scene painters like Thomas Hart Benton (1889-1975) and Andrew Wyeth (1917-2009), the magic realists George Tooker and Paul Cadmus (1904-99), the Social Realists Reginald Marsh (1898-1954) and Ben Shahn (1898-1969) and the Op-art painter Bridget Riley (b.1931). Tempera painting continues to be used in Eastern and Southern Europe where it is the official medium for icon paintings in the Greek and Russian Orthodox church. Here is a short list of celebrated tempera paintings, listed chronologically by artist, which can be seen in some of the world's best art museums.  Maesta (1308-11) Siena Museo dell'Opera del Duomo.  Stroganoff Madonna and Child (c.1300) Metropolitan Museum of Art.  Christ on the Cross (1340) Fogg Art Museum, Cambridge, Mass.  Dormition of the Virgin (1392) Tretyakov Gallery, Moscow. 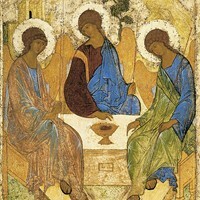  Holy Trinity Icon (c.1411) Tretyakov Gallery, Moscow.  Portrait of Ginevra d'Este (1434) Louvre, Paris.  The Annunciation (1432-4) Museo Diocesano, Cortona.  Battle of San Romano (1440), Uffizi; Louvre; National Gallery, London.  Hunt in the Forest (1470) Ashmolean Museum, Oxford.  The Wilton Diptych (1399) National Gallery, London.  Virgin and Child (1426) National Gallery, London.  The Avignon Pieta (c.1454-6) Louvre, Paris.  Flagellation of Christ (1460) Galleria Nazionale delle Marche, Urbino.  Miracle of the True Cross (1500) Galleria dell'Accademia, Venice.  St Job Altarpiece (1480) Galleria dell'Accademia, Venice.  Ecce Homo (1500) Musee-Jacquemart-Andre, Paris.  The Annunciation with St Emidius (1486) National Gallery, London.  Birth of Venus (1482-6) Uffizi, Florence.  La Primavera (1482-3) Uffizi, Florence.  Old Man with a Young Boy (1490) Louvre, Paris.  Pieta (1494-5) Uffizi, Florence.  Virgin and Child with Saints (Madonna of the Otto) (1485) Uffizi, Florence.  Dream of St Ursula (1495) Galleria dell'Accademia, Venice. 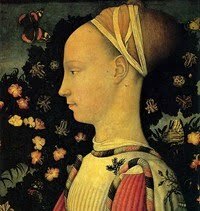  Portrait of Simonetta Vespucci (1482) Musee Conde, Chantilly.  Christina's World (1948), tempera on panel, Museum of Modern Art.  For more about tempera painting techniques, see: Visual Arts Encyclopedia.